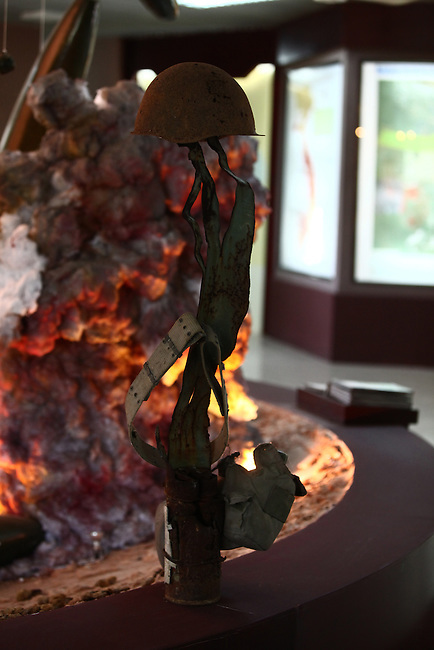 A sculpture made from an old U.S. steel helmet, web belt, canteen and bomb shrapnel is on display in a mine education center in Cam Lo, Vietnam. According to experts, Quang Tri province was the most heavily bombed province during the Vietnam War, and more than 7,000 people have been killed or maimed by land mines and bombs since the war ended in 1975. The mine education center is designed to teach school children and other visitors the dangers of unexploded ordnance. Project RENEW and several other non-governmental organizations are working to make Quang Tri province safe within the next five years. April 23, 2013.